The last few years have had many elections. The 2016 presidential election, the French presidential election, the general election, the other general election and the impending 3rd general election. But all of them are irrelevant compared to this! *Cough* Yeah, sorry for that. But anyway, school election episode. I can’t think of a segway. The episode starts off with Calvin and Hayley being late to school where we get introduced to Phonepanzee, a monster who can copy people’s voices. I have a lot of problems with this villain. Firstly, considering he has to collect the voices individually, why didn’t he just watch clips of past Galaxy Warriors episodes and collect them from there? Considering how quickly he got their voices in the episode it would’ve just made sense to do that. But anyway Calvin and Hayley arrive at school and they see that the student body president elections are happening so they both compete. They each hire some of the other rangers to help them with their campaign. While the Rangers were discussing the election, Phonepanzee copies the rest of their voices and they notice him after he trips on a bike. Ignoring the fact that that a bike is one of the hardest things to trip up on, this is the next problem I have with him. They can’t decide whether to make him good or bad at being a villain. For example: he trips up on a bike, making himself noticeable yet he cleverly uses the Rangers voices against them in the fight scenes. And now a problem I have with the episode as a whole, it cuts between the action and the subplot really awkwardly. When the Rangers were talking earlier, It looked like they were going to carry on with the campaign after the conversation finished. But they out of nowhere just started a fight scene. Remember how in the introduction It looked like I had a clear idea of how it was going to go but I changed it for something completely different? I did that to show how awkward the episode can be at times. And when the fight scene was over, they went back to the subplot nbd acted like nothing happened. So yeah, the presidential campaigns go on normally until someone starts a food fight using some cake that Hayley and Calvin were giving out as freebies. The writers then decide to actually do something clever and make Phonepanzee phone the Rangers individually, pretending to be another Ranger blaming the food fight on a different Ranger. So Brody, Calvin and Sarah go to confront Hayley, under the impression that she started the fight, and they getting kidnapped and their power stars get stolen by Phonepanzee. Hayley and Preston hear that Calvin started the fight but they get stopped by Mick on the way, telling them they they shouldn’t believe everything they hear. While that is a good lesson, how does Mick know that the monster was behind the phone calls? In fact, I don’t even think he knew about the food fight. They go and investigate anyway and they bring Levi with them. They release the other rangers and retrieve their stars. They all morph and defeat Phonepanzee using one of the coolest finishers in the show so far. He, of course, grows (after a nice season 1 reference) and they defeat him using the Megazords. They go back to school and Calvin and Hayley withdraw from the election after all the trouble competing has caused. Besides a few clever moments, this wasn’t a very good episode. It awkwardly cut from the action and the sub-plot and it had a ton of unnecessary scenes. It felt like an episode from earlier in the season where they had no idea where the series was going to go. Power Rangers Ninja Steel: The Story So Far. Power Rangers Ninja Steel is the 24th and current season of Power Rangers. It was adapted from the Super Sentai series “Shuriken Sentai Ninninger”. Next year, it was get a second season called ‘Power Rangers Super Ninja Steel’ which will celebrate the franchise’s 25th anniversary! Before then, let’s have a look at how the series is going so far. Just a warning, this will contain spoilers for the first 12 episodes of the series. If you haven’t seen any of these episodes, I would recommend catching up if you don’t want these episodes to be spoiled. Ten years ago, a mysterious star shaped object called “The Ninja Nexus Prism” crash landed in the backyard of Dane Romero, Earth’s greatest ninja. Dane removed the metallic ‘Ninja Steel’ coating of the prism revealing the Ninja Nexus Star, a powerful shuriken. Not long after, the monster Galvanax came to search for the prism, so he could use the star’s power to rule the universe, attacking Dane’s son, Brody, in the process. He tells his other son, Aiden, to run away with the Ninja Steel and hide it. Dane goes to rescue Brody from Galvanax and uses the Ninja Nexus Star to transform into the Red Ninja Steel Ranger. However, he fails to defeat Galvanax and loses the Ninja Nexus Star to him. In a final attempt to defend the universe, Dane breaks the star into six pieces but sacrifices himself in the process. The six broken pieces appear in the Ninja Nexus Prism and they transform into six Ninja power stars. Galvanax’s general, Ripcon, captures Brody and makes him a prisoner on Galvanax’s ship. 10 years later, in the present day, Galvanax’s ship goes back to earth to film his TV show, Galaxy Warriors, and find the Ninja Steel. After learning Galvanax’s plan, Brody escapes the ship with Redbot (a robot), Mick (the ship’s mechanic) and the Ninja Nexus Prism. However, they crash land with Brody and Redbot being separated from Mick. After they land, Korvaka (one of Galaxy Warriors’ contestants) follow Brody in hopes of finding the Prism. Brody gets attacked by Korvaka but Sarah and Preston, two students from the nearby high school, come to rescue him. Three of the stars inside the prism glow, Allowing Brody, Sarah and Preston to transform into the Red, Pink and Blue Ninja Steel Rangers. They defeat Korvaka and decide to go back to Brody’s old house to look for Aiden and the Ninja Steel. Meanwhile, Calvin, a car enthusiast, and his girlfriend, Hayley, find Mick while driving. Suddenly, an army of Kudabots try to attack them. Calvin and Hayley escape from the Kudabots and go to the high school. When they arrive, Mick gets mistaken for the new teacher. 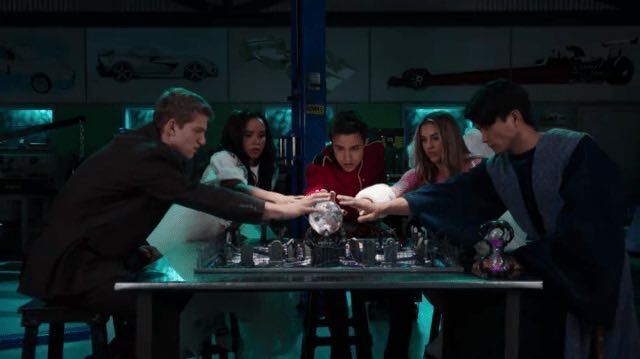 When Brody and his friends arrive at his house, they find a clue left by Aiden telling them where he hid the Ninja Steel: at the high school inside a trophy that his dad won. After telling Mick through his datacom, another contestant named Ripperat attacks Calvin and Hayley but the prism lands in front of them. Two more stars glow and Calvin and Hayley to transform into the yellow and white Ninja Steel Rangers. Brody and friends arrive at the school and they defeat Ripperat but he grows to giant size. The prism shows a vision of five Zords and, with five new power stars, they use the Zords to defeat Ripperat. They go back to the school and convert the out of order painting room into their new secret base. To close the episode, Sarah points out that one of the power stars is missing. It is then revealed that another one of Galvanax’s minions, Madame Odius, has the last power star. While the other Rangers are studying for a quiz, Brody gets alerted by his datacom that a new contestant, Spinferno, has landed on earth. He goes alone to fight Spinferno using his datacom to help. He goes back to school for the quiz but he uses the datacom to cheat. He gets caught and puts the datacom into his bag. It later falls out of his bag so, when Spinferno comes back, they have to defeat him without it’s help. Galvanax summons a giant Skullgator to fight the Rangers. It overpowers the Ranger’s Zords but they form the Ninja Steel Megazord and defeat it. As an apology, Brody presents the Rangers with ninjacoms, a way to communicate with the team from long distances. After one of his magic shows fails, Preston discovers he can do real magic. Meanwhile, Brody discovers Galvanax has landed on earth. The other Rangers come to help him, but Galvanax retreats and summons another contestant, Slogre, to defeat the Rangers. Slogre attacks Sarah, Calvin and Hayley with mist but Preston scares him off using magic. Preston decides to try out his magic in another show but he ends up harming some of the other students. Meanwhile, Sarah, Calvin and Hayley discover that Slogre’s mist makes them slow down. Slogre steals their power stars but Preston uses his magic to get them back. He learns that he can only use his magic to help others and not for personal gain. He and Brody defeat Slogre and the rest of the team go back to normal speed. 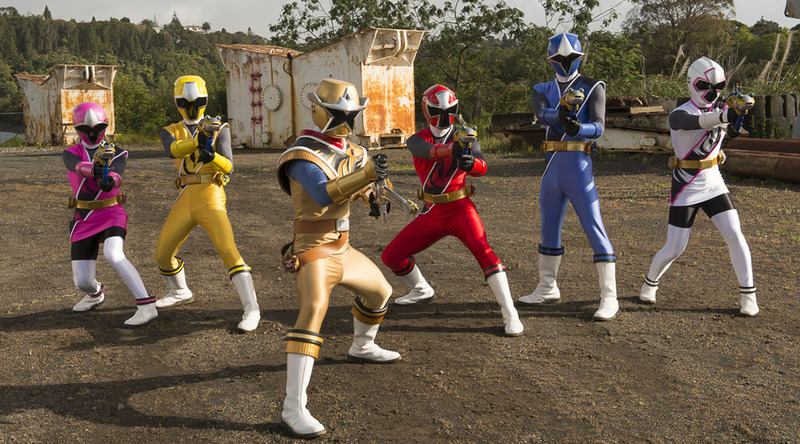 Slogre grows to giant size and the Rangers form Ninja Steel Megazord: Dragon Formation to defeat him once again. The team sees Calvin working on a new motorbike. After Sarah asks him if she could have a ride after him, Calvin reveals that he can’t drive due to a fear he has. So, Sarah offers to teach him. While Calvin is learning to drive, he falls off the bike and runs off. Meanwhile a new contestant, Tangleweb, captures the Rangers and eats them and Calvin’s new motorbike. When it is learned that the only way to help the team escape is to drive the motorbike out of Tangleweb, Calvin faces his fear and uses the bike to break the barrier to the exit. The Rangers defeat Tangleweb and he grows to giant size. They summon the Zords but Tangleweb traps them in webs. Luckily, the Prism creates a new Zord, the Rumble Tusk Zord, and manages to break the other Zords free. They form the Rumble Tusk Ninja Steel Megazord and defeat Tangleweb once more. Redbot is seen reading a fairy tale book about a ball. He asks Hayley whether she would like to go to the school dance but she declines, under the impression that he was joking. When she returns to the painting room later that day, she finds that Redbot is gone. She uses her dog, Cody, to help her find him but comes across another contestant, Badpipes. Badpipes uses his bagpipes to hypnotise her into giving him her Power Star but before she can hand it over, Redbot kicks him, knocking the bagpipes out of his hands. She tries to escape using Redbot’s rocket boots but they only get so far before they crash land. She recovers from the but Redbot and her ninjacom malfunctions. Hayley sends Cody out to get help while Redbot reboots. She realises that Redbot wasn’t joking earlier and apologies to him. She follows after Cody but the Rangers arrive before she can catch up with them. Badpipes appears with Ripcon and uses his bagpipes to hypnotise the Rangers until Hayley arrives and destroys the bagpipes. The Rangers fight Badpipes while Brody Fights Ripcon. Ripcon retreats and the Rangers beat Badpipes. He grows giant but the Rangers form the Rumble Tusk Ninja Steel Megazord and defeat him again. It is then revealed that Madame Odius is keeping a prisoner that appears to be powering the Gold Power Star. Hayley, feeling bad for Redbot, dances with him back at the painting room. Sarah is seen attending various clubs at the same time. Afterwards, when demonstrating a new upgrade for the Ranger’s Ninja Blasters, her teammates ask how she could be at multiple clubs at once. Suddenly, a new contestant, Hacktrack, attacks the Rangers and somehow makes Sarah disappear. The team goes back to the painting room to warn Mick about what happened, when they see Sarah sitting in front of a set of monitors. She explains that she’s been using holograms to make it look like she’s been taking all the clubs. Hacktrack then manages to utilise Sarah’s holograms to make multiple giant Galvanaxes appear. Sarah creates four holograms of herself to try and find a new way to deactivate the Galvanax clones. 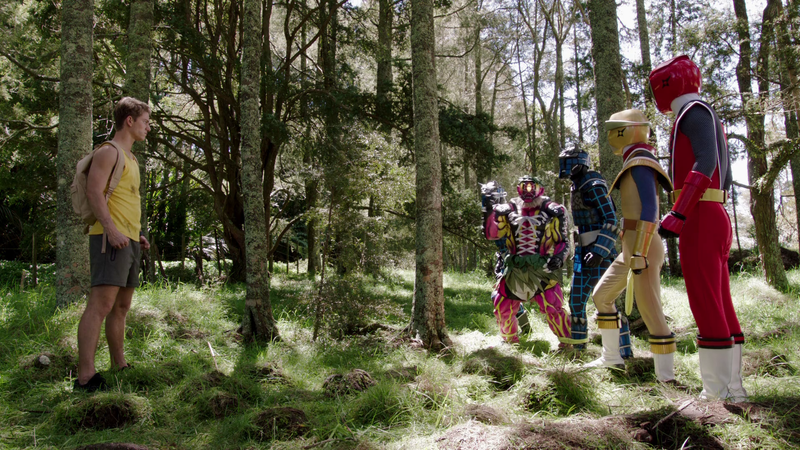 Meanwhile, the rest of the Rangers try to stop Hacktrack. When her clones end up disagreeing with each other, she deactivates them and tries to stop the clones on her own. She creates a fake hologram projector that makes Hacktrack lose control of the clones. The team defeat Hacktrack and he grows to giant size. The Rangers summon their Zords but Hacktrack files into space. They catch up with him using the new Astro Zord and the Astro Ninja Steel Megazord. They defeat Hacktrack but the Astro Zord flies off to Galvanax’s ship. Madame Odius’ prisoner uses the last Power Star to transform into the Ninja Steel Gold Ranger and escapes in the Zord. The Rangers go to an autograph signing event for the country singer, Levi Weston, when Ripcon attacks with Kudabots. Brody rescues Levi while the other Rangers fight Ripcon. Ripcon makes Levi’s manager trip, revealing the Gold Power Star in his briefcase. The manager escapes while Levi asks Brody to be his bodyguard. Ripcon retreats but captures the manager. Brody is getting burgers with Levi when he is alerted that Ripcon has captured the manager. The Rangers try to fight Ripcon but they get caught in a net. However, the Rangers manage to rescue the manager and the Power Star but he can’t morph and runs away. 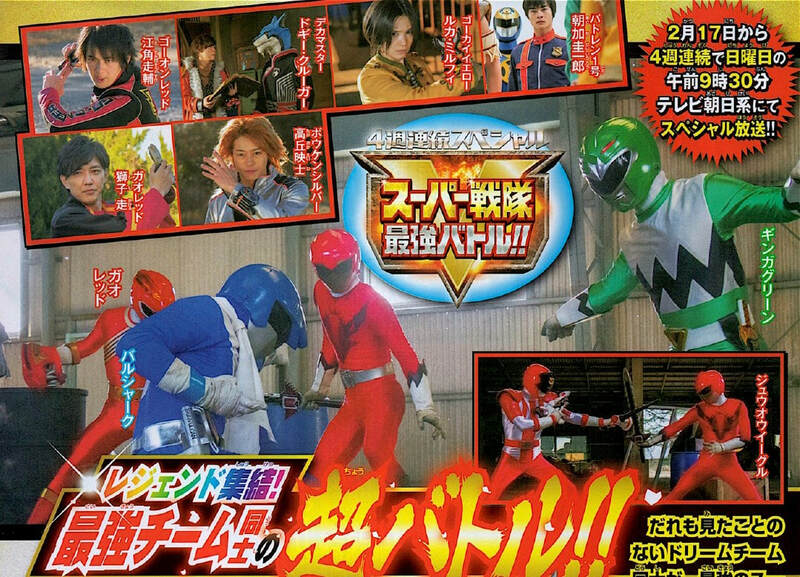 From out of nowhere, Levi enters and picks up the Power Star to transform into the Gold Ninja Steel Ranger. Ripcon retreats but a Skullgator appears in his place. The Rangers form the Ninja Steel Megazord to defeat it. The Rangers are attending one of Levi’s concerts when they notice frequent earthquakes. They go to investigate when they find that a new contestant, Stonedozer, is causing them so he can try to destroy the concert hall. The Rangers manage to stop the concert and rescue the people before the building is destroyed. Stonedozer tries to escape but Levi catches up with him and defeats him. He grows to giant size but the Rangers summon the Bull Rider Megazord and the Rumble Tusk Ninja Steel Megazord to defeat him once again. The Rangers are seen at the ribbon tree, a tree that people tie ribbons around to commemorate special occasions. As the Rangers talk, some people arrive and threaten to cut down the tree, to make way for a new building. When learning this, the Rangers try to protect the tree. It is revealed that Preston’s father is in charge of the building, he argues with the team and then leaves with Preston. The rest of the Rangers put up flyers in an attempt to save the tree. Preston returns and a protest is started in an attempt to save the tree. Preston’s dad tries to cut it down anyway but a ribbon celebrating Preston’s day of birth falls down, causing him to have a change of heart. As the Rangers are putting up a sign for the tree, a man walks up to Brody revealing himself as his brother, Aiden. As an army of Kudabots attack the city and the Rangers, with Aiden, go to fight them. During the fight, a new contestant, Toxitea, poisons Brody, offering the antidote in return for the power stars. While Mick tries to make his own antidote, Levi and Hayley takes the other team’s power stars and makes chocolate replicas of them in an attempt to trick Toxitea. The trick worked and Brody is cured. Ripcon attacks the city. Levi stays at the school to work on a new star while the rest of the Rangers go to fight. Aiden investigates in an attempt to find the Ranger’s base. Levi is delivering the new star to the other Rangers when Aiden breaks into the base to steal the Ninja Steel; Levi tries to fight him off. Meanwhile, Brody uses the Fusion Star to weaken Ripcon but he retreats before he can finish him off. The Rangers go back to the base to find Levi fighting Aiden. Levi shoots a laser beam into his chest when it is revealed that he is actually a robot. The Rangers defeat Aiden and all of his memories are transferred into Levi, where it is revealed that Levi is actually Aiden with his memories wiped. 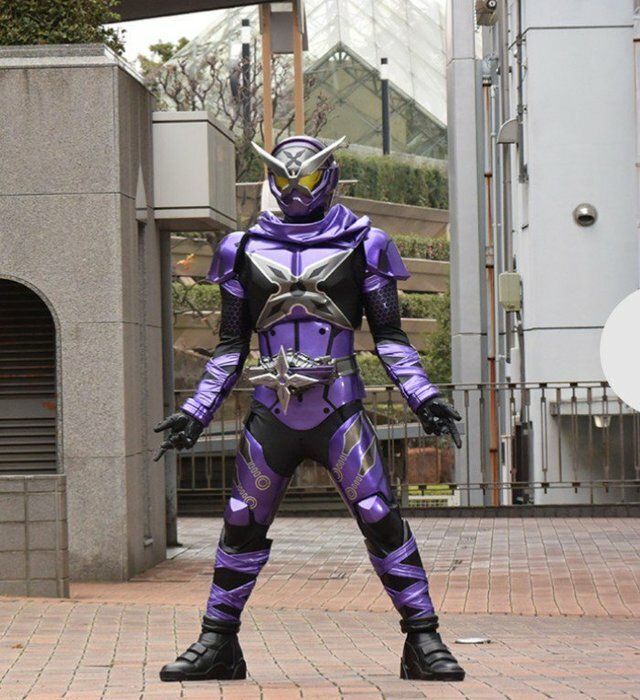 Ripcon is grown to giant size and so the Rangers use the new Fusion Star to combine the Bull Rider and Ninja Steel Megazords into the Ninja Fusionzord and defeat Ripcon once and for all. Overall, this season is disappointing so far. The acting, story and characters are a big downgrade compared to Dino Charge. However, I do feel that the series is improving. The latest episodes were actually alright and I personally didn’t see the twist with Levi actually being Aiden coming. I’m excited to see what the next 8 or so episodes will bring. What do you think of Ninja Steel so far? Let us know in the comments!